How to tell if the helmet is the right size? My child does not want to wear a helmet when riding a scooter. What should I do? How often would I have to replace the scooter helmet? Helmets make a very important part of your kid’s scooter adventures because their safety is always a high priority. Bike helmets for kids can save your little ones from serious head injuries and look great. This kids cycling helmet lives up to its brand name and protects your child’s head from bumps and impacts. The two layer foam lining and HDPE inner shell collectively prevent pinching or any head injuries from fall or collision. Not only is it tough, it is lightweight and airy. There are 11 holes throughout the youth helmet to ensure proper and fast ventilation. And the best part is that it is designed with the collaboration of Bucky Lasek, six times World Skateboarding champion so it is definitely bang for the ‘buck.’ It will make your kid feel like a pro scooter rider. If you are looking for a youth helmet that ensures you have no sweat during your ride then Triple Eight is the answer. It has thick sweat saver lining around the edges which quickly absorbs the sweat. And now you must be thinking that it must stink? Well, it also has an anti-bacterial treatment for this very reason, so neither the sweat nor stink comes in the way of your kid’s smooth ride. You also have a wide range of colors to choose from, sixteen to be exact. Of course, besides sweat control and color choices, it can protect your childs head thanks to its multi impact design. The flextech design of this amazing helmets is likely to give you one of the most comfortable design you will ever wear. This youth bike helmet comes with extra padding, keeping in view the safety of your little rider. If you are thinking about comfort and safety at the same time, TSG Full Cut Certified is just what you need to buy. Probably the best thing about this youth helmet is its safety features: the lid that to fit heads sized specifically without cramping or being a discomfort. From colorful polka dots to larger than life hearts, nutcase helmets offer so many styles. Besides style it also gives flexibility of a proper helmet fitting so your kid can use it as he or she grows. The adjustable dial strap along with three foaming pads of 3mm, 6mm and 9mm give you ample possibility of having the perfect fit. There is no compromise on added protection with the injection model ABS shell. It is one of those helmets that adults who ride scooters and kids both wear. May be you and your kid can get matching helmets and go on a ride together. This helmet is CPSC certified as it is also used by skateboarders, so there is no compromise on protection. For a kid, this kids cycling helmet is more on the simpler side of the massive variety in the market as it only offers black and white choices. The ABS hard inner shell and foam internal padding makes for a very snugly fit helmet and the 8 air channels ensure the sweat evaporates. Despite the fit there is enough room for your kid to move his/her head around. Another CPSC certified helmet that is all about providing added protection from impacts and falls. The specialty of this helmet is that it is half as heavy as the bicycle helmets for toddlers made from ABS shell. The over molded construction gives necessary added protection while keeping the weight minimal. This helmet is a good choice for smaller kids who need very lightweight infant helmets. Even if your kid rides a scooter ‘harshly’, the helmet will make sure their head stays protected and their rides get smooth. There are 5 colors to choose from: black, grey, and white and on the more playful side green and blue. This is another great helmet from Pro-Tec with stiff EPS foam liner to provide protection and sweat control. It is primarily used by skateboarders which is all the better as it is designed to provide maximum protection that usually professionals need. The straps, made from nylon, are super soft so no abrasion on the delicate chin skin of your kid. It has a high density injected molded inner shell so even a hard impact would be absorbed by the helmet. This helmet as Pro-Tec proclaims is a result of years of experience and modern technology. It is better for older kids who ride their scooters a bit more roughly than younger wheeling tots. 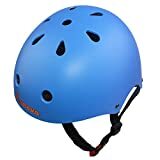 This is the most affordable child multisport helmet in this list and is nearly just as good as some of the more expensive choices of infant helmets. It has a whopping 17 holes to keep the air flowing and sweat evaporating. This surely is the helmet for those scorching and humid summer days, especially in areas where the temperature gets incredibly high. This child multisport helmet will ensure that your kid’s head gets enough air to stay cool. Very simple to use with side release to buckle the straps or adjust them. Children as young as four years can wear this child multisport helmet available in 5 colors. One of the styles of this helmet is based on watermelon which is very cool. The water helmets from Nutcase are immune to water so your kid can wear it on the beach or when it rains. The Ethylene Vinyl Acetate (EVA) absorbs no water and ensures comfort. It has a 360 degrees reflection from its logos and straps. Another good thing about this helmet is its magnetic buckle that can be buckled with just one hand, making things even easier. If your kid does water sports too, then this helmet can be used for all of his sporting adventures. This helmet is a result of innovative technology that ensures comfortable fit, comfort and venting. It has removable ear pads which can be used during tough winter days. It also features the Auto Lock 2 Fit System and a goggle retainer for Giro goggles. Be sure you have the right balaclava ski mask for skiing too from our reviews here. It fits snugly; however, there is no ring for adjusting it so make sure you get the right size. Simple, minimal but right on the money when it comes to protection. This should be your choice if you live in a cold place that sees a lot of snow. Check out the Giro Scamp or Giro Tremor as an alternative. Every kid needs a helmet and the sizes vary greatly when it comes to helmets for toddlers. A loose helmet is not going to offer the protection you bought it to provide. However, there are helmets that have a universal fit ring which adjusts to the head size. Larger helmets can be made fit with sizing pads but it is not recommended to buy a child helmet too big. Not only will it be less protective but also very uncomfortable, eventually discouraging the child from wearing it. Helmets usually have a size described in centimeters which is basically the head circumference. You can measure your kid’s head size and see if the child helmet is appropriate for them. Simply take a measuring tape or even a string and wrap it around their head, a little above their eyebrows. With this measurement you will have a rough idea about how much should the size of the child helmet be. Some manufacturers produce specific kid’s scooter helmets in small, medium and large sizes. A head circumference of a little above 20 inches would fall into small size. For medium the head circumference range is roughly between 21 and 23 inches whereas large size corresponds to a head circumference of 23 to 24.2 inches. If the helmet is too loose and moves around, then it is too big for your kid. It might even cover their eyebrows and be discomforting. On the other hand, if a lot of forehead is visible then the helmet is too small. The perfect size would be a comfortable fit but breathable so as to allow ventilation. You should not be able to get it off even on pulling it a bit. If the kid wears spectacles, he should be able to wear them along with the child helmet. The kid’s scooter helmets come with straps and adjusting pads to adjust the helmet. The foam pads are of different sizes so as your child grows you can adjust because many times you might need these adjusting pads to make the child helmet a perfect fit. The chin straps need to be taken into account too as they too play a vital part in keeping the helmet in place and can be uncomfortable if too tight or small. The child should be able to open his mouth easily with the straps on. These chin straps are adjustable too usually with a click dial. Helmets are very affordable which makes it all the more reasonable to get one. They are under $100 and some are even less than $20. Scooter helmets for very small kids tend to be cheaper than those for bigger kids and teenagers. Buying a safety bike helmet with a higher price tag will deliver quality but there is always the chance of your kid losing it. There are no standards for scooter helmets but other helmets like balance bike helmets for kids are required to meet the standards by US Consumer Product Safety Commission. In some other countries too such standards are required to be met like European CEN. These standards are only about the quality or safety the toddler bike helmets provide and do not have anything to do with the size. If you do not find this standard printed inside the child helmet, it is only because you are buying a pure scooter helmet. All kids should wear safety bike helmets no matter what age they are. There are child kbike helmets for kids scooter riders too so little ones as young as 2 or 3 years old can wear helmets. When finding the right size, age is not exactly the best measure because some kids might be taller and bigger than wheeling tots their age. Therefore, head circumference is your best bet to find the exact size. Many parents tend to buy a bigger sized helmet for their kids so that they grow into them and they do not have to replace them soon. Using a bigger helmet is acceptable as long as you are able to adjust it with pads or straps. The main differences between boy and girl helmets are color choices and themes. 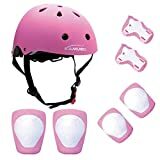 Boys’ helmets have decorative designs and cartoon characters like superheroes and games while girls’ helmets come in neon color choices with dolls and princesses. There is plenty of variety for your kid to choose from. Like the scooters they will be riding, the child helmets come from numerous brands too. Some are more popular than other. 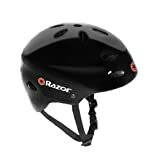 Razor is one such brand that produces quality helmets that are also super funky and affordable. A helmet that has good quality shell, soft internal padding and is not uncomfortable is the best helmet for your kid. You can easily find one under $50 and since they are cheap it is easy to replace them. Wearing a helmet is necessary even when riding scooters and some kids might not want to wear one. Some find it uncomfortable while some think they are too strong to need a helmet (Kids, I tell you). As a parent, it is your responsibility to ensure that your kid wears the youth bike helmet. Most parents do not wear helmets themselves and subsequently their kids do not want to wear either. The best way to influence your kid is to follow the same and wear a helmet when you are riding your bike, if you have one. Otherwise, the different kind of styles, colors and themes are there to attract your kid’s attention. Buy them a child helmet boasting their favorite cartoon character or superhero and they will never forget to wear it. You can even try showing them other kid’s wearing helmet in your neighborhood or even in videos online. This thing bugs parents the most that they will have to replace the safety bike helmets every now and then. Usually, you would not have to replace one for at least a year or two. Unlike arms and legs, heads do not grow that fast so if you bought a helmet for your kid who is, say 4 years old, it may very well work until he turns 6. You most likely would have to buy new one if it is broken or is lost. Some toddler bike helmets after getting hit or crushing might not recover and would not be the same. In such a case you will have to buy a new one. Fortunately enough, these safety bike helmets do not cost a lot and are often available at discounted prices. Yes even a toddler needs a safety bike helmet whether they are riding a bike, scooter or even a skateboard. Children of all ages will need a helmet to provide protection for their heads. However, toddlers’ necks are not that developed and would not be able to stand a very heavy helmet. So for toddlers make sure that the helmet is lightweight without compromising on quality. Also, toddlers’ head size and shape varies and you would want to give special attention to size again in order to find the best fit for your toddler. With toddlers, it is recommended that you put the helmet by yourself and tight the straps because toddlers might not be able to wear them correctly or at all. For very small children, it is also advised that even after putting on helmet, you oversee them. Scooter helmets are absolutely essential because they ensure your kids’ safety. Even a minor fall can leave a serious impact on your kid’s head and you do not want to take that risk. Finding the perfect helmet requires good quality, fit and of course your kid’s favorite color or cartoon. The pads inside the helmet will help make it further fit and the helmet will last long even when your child grows. They are quite affordable and come in many colors. Make sure to involve your kid in the buying process because after all he or she is going to wear it.